Planning the Homeschool Year for Your Child with Special Needs: Part 8 – Planning the Week - GABRIELLA VOLPE, B.Ed.GABRIELLA VOLPE, B.Ed. Now that you have clarity on what you’ll do each month, you can officially sit down to plan the weeks in a particular month. I personally plan the weeks one day at a time (yes, I said one day, not one week at a time) because so much can happen and shift on a daily basis. I like the freedom of being able to tweak my plans based on my daily observations. While it’s a great idea to have a monthly overview, planning exactly what you’ll do each week can become so overwhelming that you may find yourself blocked (is there such a thing as planner’s block?) Coming to a dead end will not motivate you to keep going, so I’m trying to prevent that kind of confusion from overtaking your planning. You want to keep this as simple (and as stress-free) as possible. When you plan each week of the month, you are basically breaking down your monthly objectives by week – ahead of time. For instance, if you are choosing to make September, say, apple month, your smaller objectives might be to experience sensory activities with apples, read books/stories about apples, go apple picking, do some baking with apples, do some numeration and sorting using apples and seeds, and also learning about the parts of an apple. You can list these objectives/activities and then plot them into your calendar on a weekly basis. You might choose to read stories and do some sensory activities in the first week of the month, do some math and science on the second week of the month, go apple picking and do baking on the third week of the month, and so on. You’ll feel restricted by the weekly plan – possibly causing you and your child stress. Your weeks aren’t going to be well-rounded – not allowing your child enough practice with a particular skill. When you plan daily for the week, you fundamentally dissolve the issues of planning restrictions and unbalanced skill acquisition. Here is what I developed to help me not only make weekly planning easier, but to make sure that I touch on a little of everything each week. Remember when we talked about curriculum in part 4 and part 5? I had listed and categorized all of the goals (therapeutic and personal) and matched them with the standards/ competencies required for the preschool level (the level my son is presently at, more or less). My brainstorm: listing all of the therapy and personal goals and matching them with the provincial curriculum. My weekly planner. You’ll notice that I have a column for each standard/ competency and a row for each day of the week. First of all, plug in all activities going on this week that might be an interruption to schooling. Are there appointments? Sporting activities? Gatherings with friends? Write those in first so that you don’t forget. It also gives you an overview of how many days you really have this week to work on specific skills. Using the monthly objectives you’ve already devised (part 7), make a list of specific skills and activities you’d like to do. No need to get fancy. Just brainstorm in your Homeschool Reflections journal. Decide which of the specific skills/ activities you want to work on this week. Slot in a few of those activities under the headings in your chart for Monday. 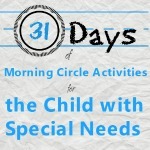 Because my son is a preschooler, I only plug in 2-3 activities per day. You might be able to fit in more – or, perhaps, less. You know how much your child can handle in one day. Don’t feel pressured to fill in each box for each category. Not only is that unrealistic, it’s also unnecessary. Remember that your child has the entire week to work on the skills you’ve outlined. Space them out. Make it doable. After you’ve completed your day, decide if that was too much, too little, just enough? Then, decide if your child needs more practice with the task, or if you can move on to something else you wanted to accomplish this month. I know that this quick daily assessment helps me tremendously with my planning. By the end of that day, I know whether I need to keep reinforcing the skill, if and how I should tweak it, or if I can drop it altogether because he’s achieved it – or even surpassed it (maybe the activity I had planned was below his skill level). Then, follow steps 2 to 5 again for Tuesday. And so on. My weekly planner is set-up as a visual tracker of all of the skills I want to tackle in one particular week – even though the planning is done daily. When planning for subsequent days, this chart makes it clear to you what you need to add so that the week is well-balanced. If all you have planned is language and crafting activities for Monday through Wednesday, by Thursday, you’ll be able to visually track what’s lacking. You may decide that you should probably include some science, nature and math activities. What are the curriculum requirements for my child’s level? What are my monthly objectives for my child? Therapeutic objectives? How can I combine my monthly and therapeutic objectives to meet the curriculum requirements this week? If my child needs more practice with a specific skill, in which categories can we implement the practice this week? For example, while working on the pincer grasp this week, I not only planned for that skill to be practiced in play, but also on our nature walk in picking up flowers by their stems, in a craft activity, as well as in self-feeding of small cereal bits. Spacing out monthly plans into weekly plans is simple enough to do once you get the hang of it. Would you like some help with this? We can talk about what your monthly goals are and have them match-up with therapeutic objectives and your province/ state’s curriculum. Thanks for the words of encouragement, Cynthia! I feel honored that you visited! Thank you for that feedback, Maria! I’m happy to have you here!